Having a starter Pokemon with 2 Stages of Evolution is as quintessential to the franchise as there being 8 Gym Leaders. And then they changed both of those, so it’s not even the same thing anymore. Go figure. Delphox is a Stage 2 Fire Pokemon, 150 HP, with a Water Weakness, no Resistance, and a Retreat Cost of 2. The Ability is Mystical Torch, which lets you Burn the Active Pokemon once each turn. 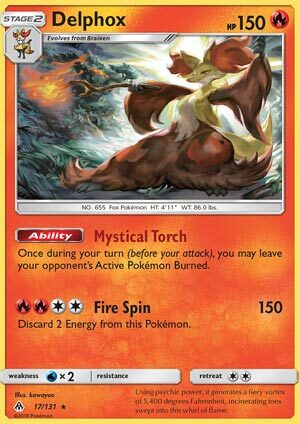 And then there’s Fire Spin, a 4-for-150 move that discards 2 Energy from Delphox. So the real appeal of Delphox is Mystical Torch. Not because Fire Spin is bad or anything, but it’s just not as flashy or impressive as you’d like it to be on a main attacker. So looking back on the Burn condition, is it worth it to bring out Delphox to just Burn the opponent’s Active Pokemon whenever they’re not? There’s potential to combine it with Burn-synergy cards like Infernape, but there are additional problems that come along with that. Not to mention Infernape already has a built-in Burn to his attack. I’m sure there’s some off-beat Burn deck that Delphox could fit in, but for the time being, such a deck isn’t around, so it won’t likely be…well, on fire. Side Review: Xerneas – Xerneas has a little potential with lead, but the Supporter you’re looking for really needs to have an impact on the next turn to pay off. Bright Horns is also not the ideal attack you want for a Pokemon, so he ends up being delegated to a job that is already being done better by Tapu Lele-GX. Next Time: PRRRRRRRRRRRRRRRRRRRRRRRRRRRRRRRRRROMOted Legendaries are interesting sometimes. Today on Torch Tuesdays we’re looking at Delphox from Forbidden Light. With this card only legal in Standard and all the other Delphox cards in Expanded, I shall try to give some insight on how it’ll be used. For Standard, Delphox is all about its ability placing a burn special condition on the Defending Pokemon. Decks revolving the burn special condition will love this card if you don’t have other method of inflicting burn. Unfortunately Infernape does it better as it has an attack that inflicts burn, and an ability that ramps up the damage counters to six of them for burned Pokémon. So looks like Delphox is outclassed of that department. What about Expanded? You got several other Stage 2 Delphox cards and two of them are very good. You’ve got one from the XY version that is an ability based draw while the Fates Collide version has a scalable damage output via Psystorm. Deck space is tight, so you might fit one of today’s card on a dedicated Delphox deck. You could swap out the XY version with Oranguru if you still want ability based draw. And then there’s Delphox BREAK who supplies energy acceleration so that maybe Delphox can possibly use Fire Blast turn after turn. It might outdo Psystorm if your opponent has very few energies on the board. Overall, Delphox is a good card, but it has to be the focus of a few decks to make the most out of this card. Automatic special condition is nice, but being on a Stage 2 seems a bit underwhelming due to the time it takes to reach that stage.